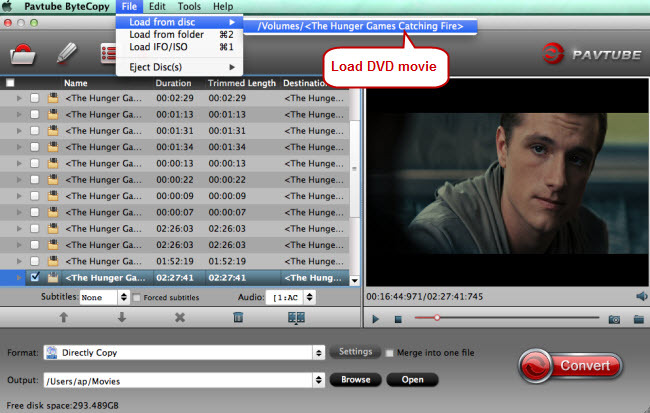 Click “File” button on the sub-menu bar to load source Blu-ray/DVD disc or folders. You could directly load Blu-ray disc from disc drive by clicking the invert triangle button. Also, you could drag and drop source Blu-ray movies to the program. In the dropdown list of Format menu, you can find the format you like. Just below Format is Output, here you can browse your computer for a better destination folder for ByteCopy to output your converted movies. Click Settings bar, you can adjust the level of compression to suit the quality you want. If you prefer a much better video quality and don’t mind the output file size, you can rise the video bit rate higher. Generally speaking, the higher video bit rate will result in the larger output file size, and vice versa. Click the big “Convert” button to start copying Blu-ray/DVD content for watching and you can freely choose the audio channel you like.